Heat oven to 350°F. Line 15x10x1-inch pan with cooking parchment paper; spray with cooking spray. Make cookie dough as directed on box, using egg, butter, oil and 1 teaspoon vanilla listed above. In pan, break up cookie dough; press dough evenly in bottom of pan to form crust. Bake 14 to 16 minutes or until edges are light golden brown and cookie is set. Cool completely, about 30 minutes. In small bowl, beat cream cheese, sugar and 1/2 teaspoon vanilla with electric mixer on medium speed until smooth and creamy. Spread mixture over cooled crust. Arrange fruit over cream cheese. Stir or beat jelly with whisk until smooth; spoon or brush over fruit. Refrigerate until chilled, at least 1 hour. To serve, run a knife around edge to loosen. Cut into 6x4 rows. Cover and refrigerate any remaining pizza. 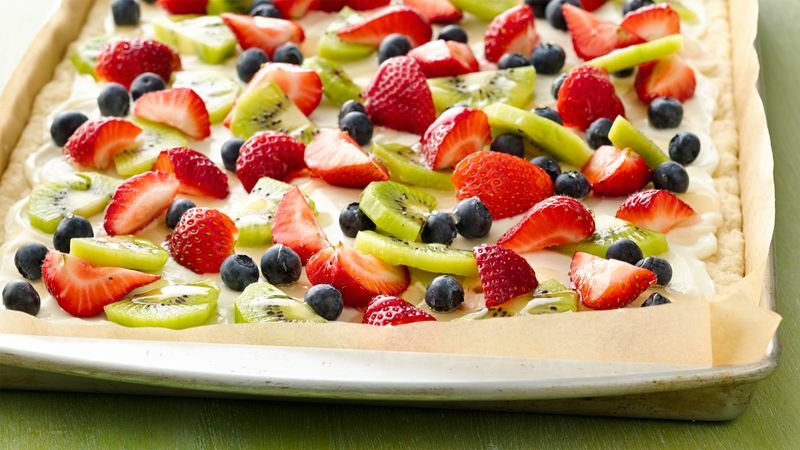 Use your favorite fruit on top. Try raspberries, blackberries, fresh peaches or bananas.